EDN members and a few guests gathered in August 2014 in Faro, Portugal. 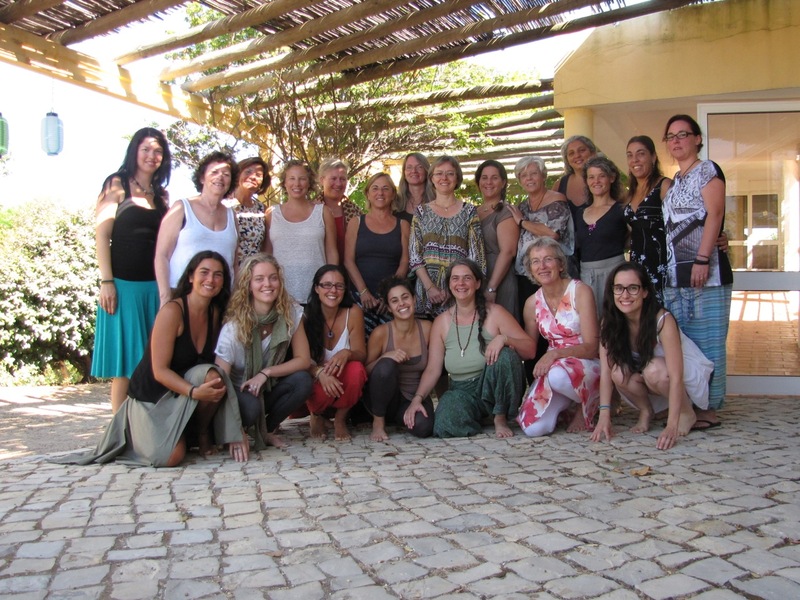 The meeting was organized by Doulas De Portugal, in particular Ana and Maria. In two and a half days we experienced a fine mixture of discussions and sharing knowledge on the doula calling, connecting and informing each other about situations that each country is facing with her doulas, as well as supporting on personal healing, through rituals, body work and singing. Our meeting was further enhanced by the beautiful natural surrounding that the organizers had chosen (www.montemariposa.pt) and the lovingly and carefully home-grown and home-cooked food offered by our hosts. The invaluable, sensitive and discreet support from the wonderful fathers taking care of the doulas’ children also made our meeting run smoothly. Thank you all!! Our meeting started with introductions; we were 15 doulas originated from many different parts of the world (including Germany, Spain, Argentina, Uruguay, Netherlands, Greece, Belgium, Israel, Brazil, Switzerland, UK and USA and 7 doulas from Portugal). The ages ranged from 24 to 69 years old and the doula experience from 1 to 43 years. Amongst us there were non-mothers, mothers with one to as many as seven children, and grandmothers. EDN doula members from Slovenia, Czech Republic, France, Poland and Hungary had sent their greetings electronically and wished us a good meeting. The main reason for some doulas not being able to participate this year (both from other countries and from parts of Portugal) was financial difficulties. Other reasons were discussed by the country representatives. The whole meeting was being observed and documented (with interviews written notes and filming) by a Portugese anthropologist making a research and film about doulas. When the project is complete, she will send the results and any interesting material for use by EDN. Every year the host country and the sponsored organization from another country present in detail the situation in their countries around childbirth and doula work. This year there were presentations from Portugal and Greece. In Portugal homebirth was the norm up to the late 60’s, mostly handled by ‘curiosas’ (lay midwives, ‘curious’ women). The country was under dictatorial regime for 50 years, which ended in 1974. Dictatorship had consequences on birth: people shouldn’t be informed. Around that time birth was moved to the hospitals and became medicalized. There are many unnecessary cesareans and doctors are not supportive of women’s wishes at birth. 2010, 70% of births had an episiotomy. Homebirth has a low percentage (0.5%), out of which many of them are unplanned (often babies are delivered on the road by firemen), due to closure of birth clinics and long distances between women’s houses and the closest birth clinic. It is not legal, nor illegal (does not appear in Portugese law) and is paid for privately. Difficult to make birth choice, because there is no choice. Some internal conflicts between birth practitioners have resulted in the suspension of a homebirth midwife for 2 years. There have been a few cases of infant deaths during homebirths, which have created further tension around its safety. Doulas are not well accepted in hospitals. One doula is being prosecuted for homicide for the death of a baby at a homebirth. Human Rights in Childbirth lawyers have been recruited and she is waiting for her case to be examined (it has been two years since the incident happened). She has a close relationship to the parents of the deceased baby. Doulas get a lot of media coverage when hot issues arise. In Greece childbirth is highly medicalized – almost all women giving birth in Greece in the last decades have gone through some kind of serious medical intervention (cesarean, episiotomy, labor induction, separation from their babies at birth, and/or physical and emotional harassment. As many other cultures, homebirth with traditional local midwives was the norm a few decades ago (up to the last generation). Breastfeeding rates have been very low but are on the rise, thanks to campaigns from mothers, LLL Greece, IBFAN Greece, and new volunteer breastfeeding groups functioning locally and nationally, the certification of two baby-friendly hospitals in Athens, interest from birth professionals to become IBCLC’s. Homebirth rates are very low and mostly possible in Greece’s two larger cities (Athens and Thessaloniki); women living outside those cities who want a more respectful birth have to either compromise or uproot. There is a definite rise of interest in birthrights and women are being activated in fighting for their rights through different projects. There are about 30 doulas in the whole country, from 9 different Greek cities, including islands. Most of them have started recently and are not certified. There have been five doula trainings in Greece: first one only for postpartum doulas in 2007, organized by midwives, two offered by foreign trainers and two offered by the Greek Doula Association. There is a great, steady interest of women for the doula calling from all over the country. Doulas are typically not allowed in the hospitals; there have been a few exceptions and it seems that things are slowly changing, thanks to women’s and doulas’ persistence and the invaluable support of some midwives and doctors. There is a general attitude of hostility and a few cases of threats to doulas by midwives, mostly due to lack of information about their role. Doulas appeared for the first time as parts of the perinatal care team at a big national breastfeeding conference last year. This year there will be a short presentation on the doulas’ role in breastfeeding during the same conference. Greek doulas ask for your support and experience in dealing with challenges they face as they try to establish themselves as a new role in the perinatal care field. There was no time for all representatives to share the doula situation in their countries, expect for brief discussions, e.g. in Munich there is very little interest from women to become doulas, mostly due to some of the prerequisites for the training (age limit and necessity to be a mother); in many countries doulas are fighting each other; in UK there is a program for volunteer doulas working with women in prison and a volunteer doula program working within the closed Orthodox Jewish community, as well as the newly found “Feminist Doulas”; an Israeli doula living in Berlin works a lot with Israeli or ex-pats living in Berlin; in Spain there are 20 different doula trainings, one of them lasting for three years and advertised as a training for Doula and ‘Partera’ (traditional midwife), which is creating some tension between doulas regarding their range of practice; a Spanish representative, originally from Argentina, announced her support to the newly-founded World Doula Network, consisting of doulas from Central and South America and the rest of the world. The representative from the Greek Doula Association Maria Andreoulaki gave a presentation about the origins of the word “Doula”, sharing knowledge on the historical and linguistic background of the word in ancient Greece and explaining the current situation with doulas and the term used in modern Greece (Voithos Mitrotitas meaning Maternity Assistant). A Brazilian doula and psychotherapist currently studying in Portugal, Bela Josie presented on the issue of perinatal loss. Starting from her own personal experience with perinatal loss with a doula client, she went on to discuss the common cases of perinatal loss (miscarriage, stillbirth, neonatal death, premature birth, genetic syndromes; there was a short discussion about whether elected abortion belongs in the category of perinatal loss: implications included the fact that in the Spanish language the word for miscarriage and abortion is the same, and the fact that elected abortion is illegal in Brazil). She then described the grief phases, as general guidelines to recognize in parents who have suffered perinatal loss, and thus to best support them. She emphasized that there can be no strict rules regarding timeframes or sequence of appearance of these phases. Then she discussed research-based ways to facilitate the grief process, including touch, objects of memory, allowing emotional expression, touch, contact and rituals for the deceased baby. The Dutch representative Annieck Rietbergen, an experienced doula, mother and grandmother, presented on the topic of safe bonding, giving ideas about small details that can make a big difference in the first contact between mother, father and baby, both in normal deliveries and traumatic or complicated births. The UK representative Bridget Baker, a doula with decades of experience, as well as a mother and grandmother, made a presentation that was originally given to midwives, describing postpartum doulas’ role. She gave some background of her experience in working with women in prisons and refugee camps, and women who have suffered sexual abuse. She stressed the difference between ‘mothering the mother’ and ‘smothering the mother’, a word play reflecting her attitude to postpartum care by the doula (‘being’ instead of ‘doing’). She also stressed the particularities of the British system, where the father takes a 2-week leave from work and women usually hire doulas after that period, when most of the breastfeeding problems have already appeared. Her presentation was full of humorous cartoons painting a very realistic picture of the expectations and social dynamics surrounding care for the new baby and the parents. UK conducted a survey on doulas in 2012, with 1.106 women attend by 105 doulas, where it was shown that breastfeeding rates were significantly higher for the doula-supported mothers. She announced the DOULA UK upcoming Conference entitled “Compassion in Childbirth”, during World Doula Week, in March 2015, in Birmingham. Participation for EDN members is free of charge. Portugese doula Ines Duarte started with a guided meditation on a journey to the womb and then shared her knowledge and experience with living our female cycles (whether we menstruate or not) with awareness of the moon. She discussed the eight moon phases and their effects on women, how to create a moon chart, how to integrate and interpret the moon’s influences on our everyday lives. We ended with a circle traditional dance. Israeli doula Zohar Ren Karni shared with us a small part of her work with the pelvis in an experiential session using storytelling, body work, movement, visualization, information and more. Before the official presentations each morning we had the opportunity to get a taste of Ashtanga yoga practice and dance practice in a lovely studio surrounded by nature. After the presentations in the evenings we were offered the chance to participate in a sweat lodge ritual (Temazkal) and a women’s circle. Regula Brunner facilitated a meeting with doula trainers discussing the necessity, length and different approaches towards doula trainings. We also discussed the most appropriate words used for this – Education? Training? Formation? Building? Information? Course? There was a great variety of experience and ideas on the above questions. It is a topic that has no specific, correct answer and EDN members agreed to allow many different approaches on the subject. Regarding the issue of EDN being an organization that offers approval of doula trainings, it was decided that what EDN can offer is a platform for networking and connecting and not ‘policing’ or monitoring doula trainings. For doulas relocating from one country to another, EDN can offer contacts in the countries of interest so they can decide the best way the particular doula can be integrated in the birth system of each country. Already there is mutual approval of doula trainings between doula organizations in Switzerland and Germany, Switzerland and France and an upcoming one between Switzerland and N. Italy. Different options were explored (e.g. Doula UK offers a one-day Access Course for certified doulas wishing to work in the UK). On our last day we had a review of EDN’s activities in the past year and made plans for the future. We looked at the EDN country-members on a European map, noticing that Eastern European countries have difficulty in participating in the meetings, mostly due to financial reasons. A skype connection was discussed and we all took on the task to reach out to our contacts with doulas of these countries for their needs and possible ways to include their active participation, either in person or otherwise. At the moment EDN has 30 doula associations and trainings from 19 countries, with new members adding up every year and much interest for membership. Since only Doula Associations are welcome to become members, the idea of “Friends of EDN” was discussed, where individuals or clinics, hospitals and other practitioners who are supportive of doulas may become members and offer their ideas, networking and support. The names of “Friends of EDN” will appear on the EDN website. Florencia will be setting up an EDN google group for the members. We said goodbye to Regula Brunner, co-founder of EDN and active member of EDN office, and Sabine Lanfranchi, co-founder of EDN presented the new EDN office members: Lisa Sykes, an English doula relocating to Switzerland, with IT background, who will be dealing with the website, FB, can help with English and networking; Awital Zingg-Bolag, a Swiss doula who has just come back from a few years in Finland, who will be looking after the finances; We still can count on Ana Pavec’s support, a Slovenian doula, who is responsible for the newsletter; and Florencia Sabio, who is helping Awital with the memberships if necessary. We are looking forward to seeing you in our 2015 meeting in the UK!